A full 85 percent of school districts now meet the Federal Communications Commission's short-term goal for broadband connectivity of 100 Mbps per 1,000 students. And almost half of school systems (47 percent) have at least some schools that meet the long-term broadband goal of 1 Gbps per 1,000 students; 16 percent are achieving the long-term goal in every one of their schools. Funding, referenced by 61 percent of districts, continued to be the biggest barrier for districts in their efforts to increase connectivity, with a particular nod to monthly recurring costs. Those findings surfaced in CoSN's annual infrastructure survey report. CoSN is a professional association of education technology leaders in K-12. The "CoSN 2017 Infrastructure Survey" looked at the current state of technology infrastructure in U.S. K-12 school systems. While previous versions focused on E-rate and broadband status, this year's project also added cloud usage and security topics to the survey rundown. This initiative was done by CoSN in partnership with AASA, the School Superintendents Association; education marketing firm MDR; and public sector data company Forecast5 Analytics. The published report was based on 445 district responses; each district was allowed a single response to the 64 questions on the survey. More than seven in 10 respondents (71 percent) said they'd have to upgrade every component of their internet infrastructure, including the firewall, in order to meet the long-term FCC goal. For the first time in five years of doing the survey, results showed that fewer than a tenth of districts (six percent) are paying $50/Mbps or more for their internet; just five percent are paying that rate for their WANs. CoSN called this a "very positive trend," indicating that fewer districts are paying "very high monthly costs per megabit." Rural areas continue to suffer the most in broadband choices. While a large share of respondents (43 percent) have only one available internet provider, a majority (52 percent) are located in rural areas as compared to just 13 percent in urban school systems. 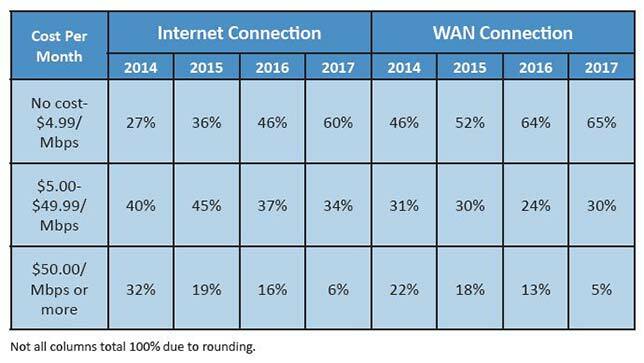 Driving the need for more bandwidth, for the second year in a row, is the use of student devices in schools. That's followed by the proliferation of digital content and online assessments. Little has changed regarding student access to non-shared devices outside of school. For three years running, fewer than one in 10 districts could report that all of their students had access to non-shared devices at home. There has been an improvement, however, in student access to devices elsewhere in the community. While last year just seven percent of school systems reported that 100 percent of students had access to non-shared devices somewhere in the community, this year 28 percent reported the same. Software as a service (SaaS) has become "an accepted practice" in school systems. Ninety-four percent of survey participants indicated that they use some type of cloud-based software system, with the learning management system at the top of that list. The primary motivation for moving to the cloud is to avoid "time-intensive installation and maintenance of software, mentioned by 82 percent of respondents; and potential cost-savings were specified by 62 percent. 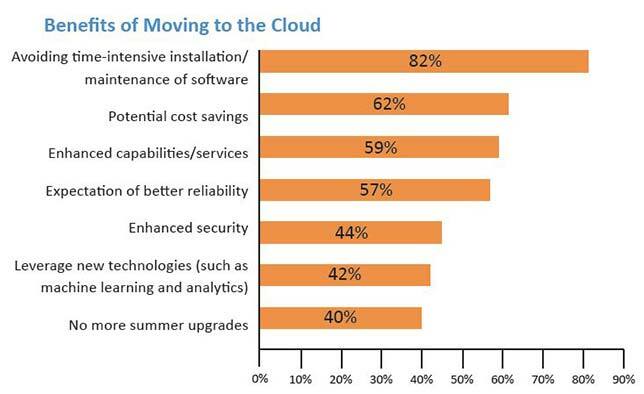 Security was the top reason for not moving to the cloud, listed by 57 percent. Districts reported putting out more on security over previous years, with 45 percent spending more than a tenth of their tech budget on network security, up from 19 percent in 2016. Surprisingly, when asked to rate the level of security risk for five types of attacks, phishing was rated as a medium-to-high or high risk by a small majority (52 percent). As the report noted, phishing techniques "have become quite sophisticated, and even security-savvy professionals are being scammed." The latest Verizon data breach report said that phishing accounts for 90 percent of all social engineering attacks leading to security incidents and data breaches. "With the move to cloud-based systems, increased use of online content and assessments and the proliferation of mobile devices, districts struggle to continually evolve their network infrastructure to keep up," the report concluded. "Although the demands have changed over the five years, the mission for districts has not--to ensure their classrooms provide a robust teaching and learning environment." The full report is available with registration on the CoSN website.